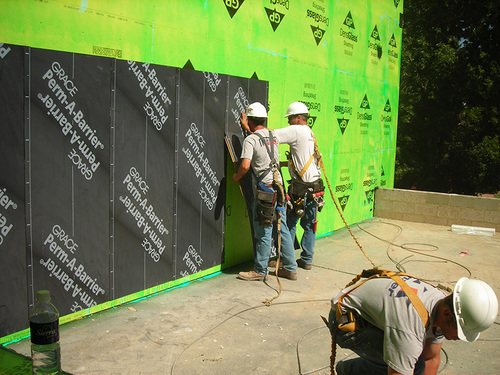 Air barrier systems help separate the outside environment from the desired interior environment. Ultimately, an air barrier creates seamless continuity and structural integrity that helps eliminate uncontrolled air leakage and allows control over temperature, humidity, moisture and air quality throughout the building. With a properly installed air barrier system, you can improve a building’s performance and reduce heating and cooling costs by as much as 36%, according to the US Department of Energy. Mechanically-attached membranes, also known as housewraps, usually a polyethylene-fiber or spun-bonded polyolefin is a generally accepted moisture barrier and an air barrier. Boardstock, which includes 12 mm plywood or OSB, 25 mm extruded polystyrene, etc. The Kinzler team is happy to help answer your questions about meeting code requirements in your area. Let Kinzler Construction Services help you create a drier more energy efficient home or business. Contact us today at 888-292-2382 for help finding the right air barrier for your wall construction.